The Aventura Spa Palace Resort. The Aventura Spa Palace Resort is eagerly awaiting the arrival of Au Pair in America Community Counselors, overseas Agents and staff for our 20th Year Conference Celebration! Located 50 minutes from Cancun airport, the resort is an all inclusive facility for adults only (18+). Your accommodation, dining, snacks, 24-hour room service and various sports and relaxation treatments are included. We will have blocks of free time in order for you to take advantage of what the resort has to offer. 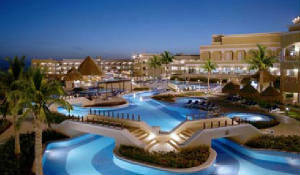 The resort is made up of 1,266 rooms, all with balconies and double jacuzzis. Check in is 3:00pm and check out time is 12:00pm. The Palace Resorts website contains further details on the services on offer and includes a photo gallery. Click on the photograph above to visit. People from all over the world relocate to this area - you will meet people from many different cultural backgrounds!